The articles I read on leadership spend a lot of time and space on the traits, characteristics and methodologies of successful leaders. That’s important, but these articles are not exposing the day-to-day nitty-gritty of office life – long, stressful hours filled with people who did not choose to work together – but in many cases must depend upon each other for work to be successful. It takes above average interpersonal skills to navigate the pressures and demands of most workplaces today. For most people, these skills are not formally learned. Add the following to an inherently stressful workplace and it’s no wonder that we’re experiencing a rise in workplace incivility and bullying. What does incivility in the workplace look like? In essence, what is considered “uncivil” is like beauty – it’s in the eye of the beholder and based on an individual’s perceptions of actions or words. However, here are just a few examples of uncivil behavior. Condescending comments, writing demeaning notes or emails, disrupting meetings, reprimanding someone publicly, talking behind someone’s back, giving someone the silent treatment, not giving credit where credit is due, rolling your eyes, and yelling at others. Being uncivil also includes excluding someone from a meeting, neglecting to greet someone, interrupting people while they’re speaking, ignoring a colleague’s request, using disparaging language or voice tone, making inflammatory remarks, etc. Of course there are profound human and institutional costs reflective of our culture’s moral compass in the workplace… but there are very deep financial costs associated with uncivil and bullying behavior that often go unexplored or even discussed. The statistics and costs are startling. A 2012 survey, Civility in America: A Nationwide Survey found that nearly two-thirds (63%) of the American people believe incivility is a major problem and three-quarters (71%) believe that civility has deteriorated over the past few years and worsened since the financial crisis surfaced in 2008. The results of a survey of 775 employees conducted by Christine Pearson and Christine Porath showed the effects of uncivil behavior on employee engagement and productivity. Using these statistics they applied them to a health care company (not indicated) with 10,000 employees and an annual gross income of $999,856,000. The company estimated that 50% of their employees would experience one episode of incivility per year – 5,000 employees. Civil behavior must be a requirement of the organization and of employment. 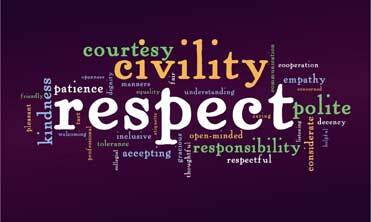 Every organization and department should consider making civility a core value, a principle that guides the internal conduct of the team or organization. Prospective employees need to know how important mutual respect/civility is in the organization. There should be a no-tolerance policy in place. In order for employees to believe how important civility is, leadership must set the example. You can’t expect employees to treat one another with respect if managers don’t treat employees or each other with respect. Employees need to be aware of the effect of their actions, attitudes, and behaviors on others. The basis of interpersonal effectiveness is self-awareness – the foundation of emotional intelligence. Only self-awareness can lead to constant self-regulation – the understanding of the impact that others have on you – and that you have on others. Through coaching, managers can help employees see how their behaviors negatively or positively affect the workplace. People are the priority, not strategy. Organizational culture is composed of people. Remember – “culture eats strategy for breakfast.” Organizations need to promote healthy relationships and realize that business transactions are done through people, not robots. Employees need to know specifically what behaviors are expected and which are not acceptable. Rules, guidelines and best practices for civil behavior need to be established. Healthy communication among all employees and management is a key requirement for respect. Put systems in place that encourages open communication, and promote constructive feedback so that it becomes the norm. Organizational leaders need to lead responsibly and create a safe environment so employees are not fearful when sharing concerns or reporting incidents. We can’t stop the relentless pace of change. Though we may tactfully try, we may not even be able to get our co-worker to clean up his cubicle and stop leaving garlic bread in his garbage can. Every organization and institution, backed by the daily practices of their leaders, needs to adapt a Credo of Civility – and live by it. But in the end it’s about us. We’re all subject to stress – everyone has pressures and everyone has a story. Sometimes when we truly listen – the loads that our neighbors are carrying are surprising, and often, moving. Ultimately creating a civil world – being thoughtful and respectful citizens – is up to us. One act at a time. This entry was posted in business, coaching, emotional intelligence, employee engagement, leadership, learning & development, management, organizational psychology, psychology, Wellness and tagged bullying, cognitive skills, communication, feelings, habits, human resources, interpersonal skill, mike rice, mindfulness, resistance to change, respect, self-awareness, stress, thinking. Bookmark the permalink. Thank you for your comment. I had to laugh at the idea of Gladwell’s 10K practice. You’re correct, the wonderful part of practicing the simplest act of civility, is that the payoff reverberates. There are many studies now that show that often people don’t “lack empathy” they are just so distracted and stressed they don’t pay attention to that part of their experience.